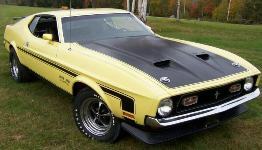 The 1971 Mustang Boss 351 came only in the fastback body style and included either the 330hp, Ram Air, 351ci Cleveland, V8 engine; and with many of the 1971 Mach 1 options including competition suspension, functional black spoiler, blacked out NASA-styled hood, honeycombed grille, color keyed racing mirrors, hub caps or trim rings, black or argent silver stripes, and fender moldings. Grabber Yellow 1971 Mustang Boss 351 fastback with a 330hp (at 5400rpm), 351 cubic inch, 4 barrel, V8 engine. This car has only 19,235 miles on it with original paint, interior, and tires. Grabber Lime 1971 Mustang Boss 351 fastback with a 300hp (at 5400rpm), 531ci, 4 barrel, Boss, V8 engine. Take a look at this awesome Grabber Lime Boss 351 Mustang fastback. It has the flat black hood and side stripes. It was probably the brightest car at the 2009 All Ford show at Uftring Ford in East Peoria, Illinois. Here's a red 1971 Mustang Boss 351 fastback. The owner closed the hood a bit due to the rain. The hood locks are up. Ford promotional photo of a Grabber Yellow 1971 Mustang Boss 351 with Magnum 500 wheels, Boss side stripes, and a bright red interior. Ford promotional photo of a Grabber Blue 1971 Mustang Boss 351 fastback with silver side stripe, silver hood with hood vents, Magnum 500 wheels, and a 351ci V8 under the hood.